Growing up in New Jersey I was surrounded by people from all over the world; on my block alone I remember families from Italy, Egypt, Lebanon, England, Spain, etc. ; needless to say, the aroma of food hovered on our small block like haze hovers over Los Angles. One of my favorite food smells came from my next door neighbor Amelia; namely, the aroma of fresh basil pesto sauce. Amelia worked in the New York City garment district as a dress designer, but her real passion was food (and the occasional Americano cocktail in the afternoon). 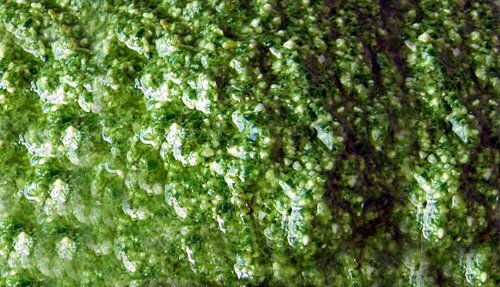 Amelia was also born in Genoa, Italy – the Pesto capital of the world. You see, in Genoa (given it’s geographic position), basil grows like wild flowers. And the basil in Genoa isn’t the metallic, bitter herb you find in your run of the mill supermarket in the US, rather it’s sweet, aromatic, and more equivalent to a succulent peach then an herb. 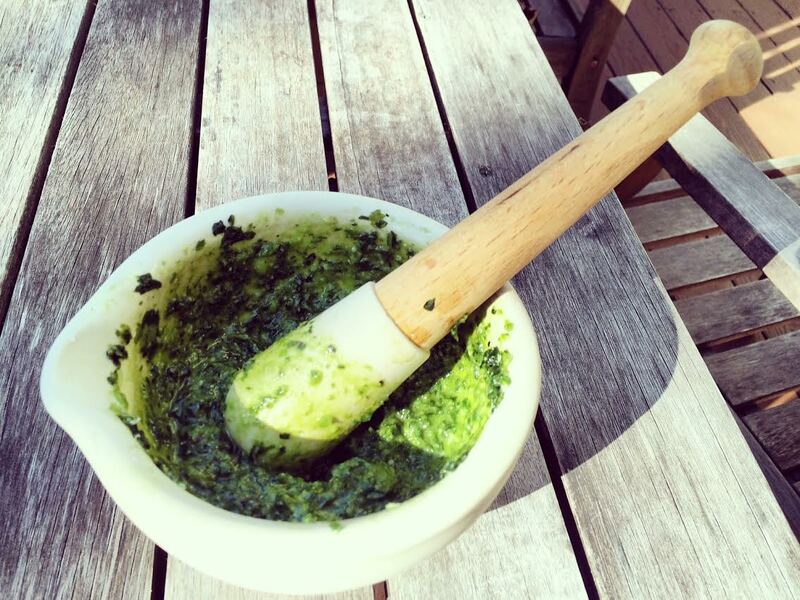 Amelia also taught us how to make our fresh basil pesto sauce recipe. Making pesto the old fashioned way – mortar and pestle. Try to find “young” basil; that is to say, first picked basil usually tends to be sweeter and less bitter. Growing basil is fairly easy and I would recommend purchasing seeds from Europe. Amelia included a bit of parsley in her recipe and while it’s not usually called for in most Pesto recipes it adds another layer of complexity to the mixture. One handful of Italian parsley (washed and dried) - you can leave some of the parsley stem, but make sure to cut off about half the stem. You can combine the above ingredients via several tools, namely, 1. food processor, 2., mortar and pestle, or 3. chopping with a large chef's knife or mezzaluna. Amelia used a mortar and pestle, but you can use a food processor (it does take a little bit away from the flavor of the pesto given the strength of the blade/machine, but, to be blunt, it's tough to get the right consistency with a mortar and pestle set up unless you're accustomed to the tool). 101 Cookbooks swears that a mezzaluna is the best tool, but I think if you use a knife for pesto you're getting more of an alio e olio type of pasta condiment. If you're going to use a food processor, start by adding the garlic and pulsing. Thereafter, add your basil, parsley, and pine nuts. Let the machine process the ingredients and slowly add your oil, salt, and pepper. Thereafter, add your cream cheese and pulse again. Finally, add the Parmigiano-Reggiano and the remaining olive oil. You are looking for a consistency just before the mixture turns into a paste. I like serving pesto with thin linguine (or linguine fine) and tend to add a splash of fresh olive after plating and, of course, more Parmigiano-Reggiano. 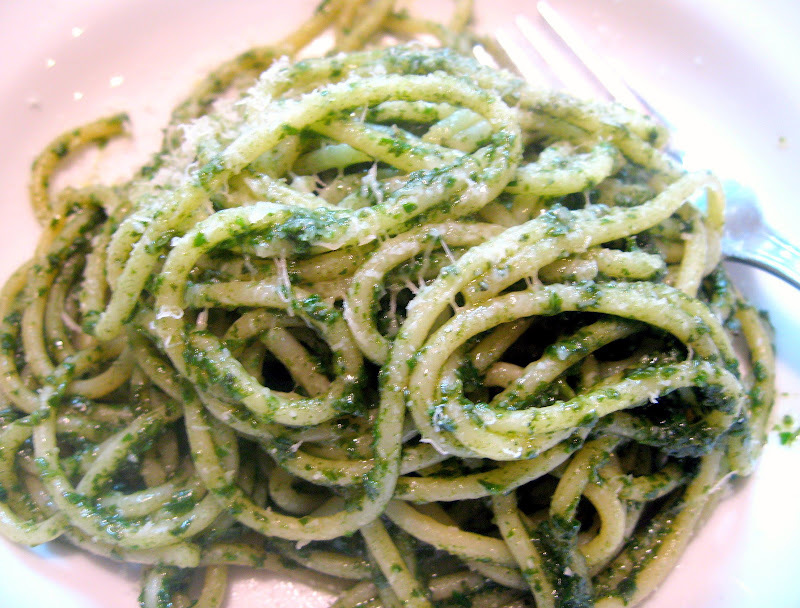 A dry red wine like Aglianico from Basilicata (southern Italy) goes well with pasta pesto. I was just searching for a good pesto recipe. I always loved Amelia’s pesto! Thanks! My Genovese husband really stresses the importance of finding the right basil. 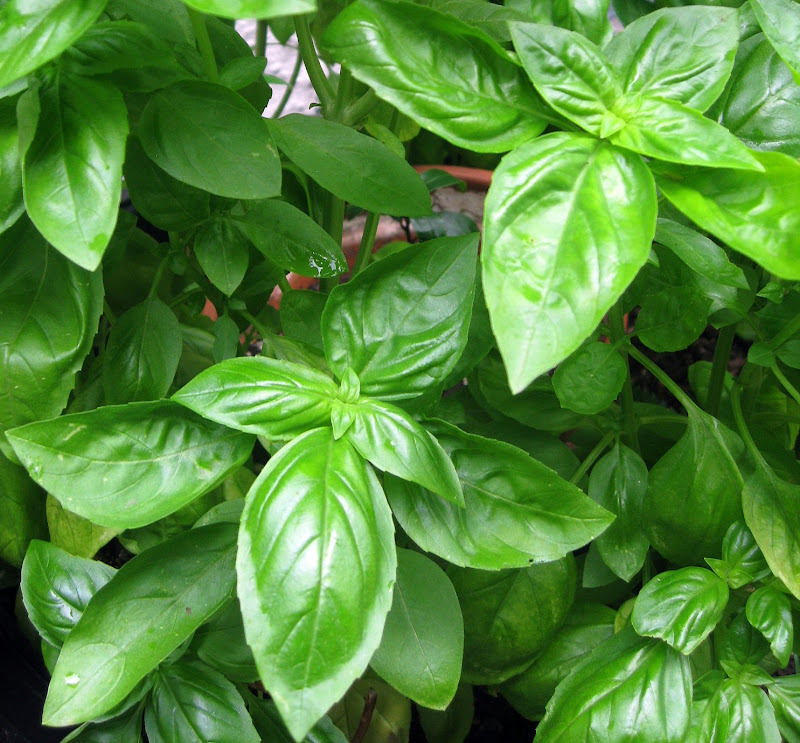 Most basil plants you find in the U.S. are already too old, so we use basil grown from seeds from Genova. If you can’t find that, I would still grow basil and pluck the leaves when they’re small and young. I’ve had pesto in Genova and it really is amazing stuff; even bottled ones are great if you find the right product. Thanks for the comment. Young basil is crucial and see is the right type of seed. I use seeds that my grandparents brought over from Calabria (we’ve been using them for about 35 years in my family). With that said, it’s very difficult to grow good basil here in the northeastern part of the US; there’s something about the Italian soil, climate, etc. that makes places like Genoa and Calabria great basil growing regions. I’d stay away from bottled sauces (just in principle) given how easy it is to make (even with less than ideal ingredients)! Can’t wait to try this recipe! Never, never heard of cream? ?–but I’m going to try it! Have heard of using a little of the warm pasta water if you’re adding pesto to pasta. 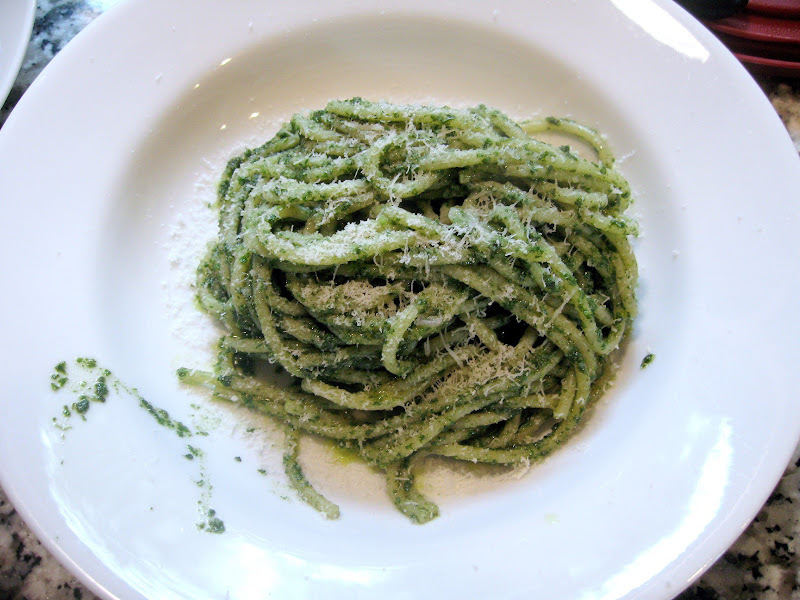 Anyway, while in the Chianti region of Tuscany I took some cooking classes–and cousins, one from Genoa argued frequently on the amount of Parmesan to include in the pesto. They also argued over the amount of sugar to put in Limoncello. It was a wonderful experience! Tried to post earlier and it disappeared. I apologize if two appear! Anyway, I was saying that I spent some time in the Chianti region of Tuscany, and each time I’m there I take cooking lessons…given by cousins, one from Genova…and they argue over the amount of Parmesan to use…they also argued over the amount of sugar to put in the Limoncello, among other things. It was a wonderful experience! This was delicious. I like the addition of the cream cheese. For the first time I grew fresh basil in a pot on my deck. I am now hooked. Next year I will try to find some either heirloom type seeds or even seeds from Italy. There is nothing better than making your own food using good, fresh ingredients. I am not Italian but I love good Italian food. I am from New Orleans and good food is very important part of our culture. I’ve heard about New Orleans the food scene down there, hope to visit one day! If you can find seeds from Italy you’ll notice a big difference in flavor (re: growing basil at home). I’m honored you tried my pesto recipe, send photos next time! Great recipe! I’ve never added cream cheese. In the Apeninnis above Genova, the recipe also calls for diced potatoes and small green beans. If you order it in Varese Ligure that is how it’s served. That region is also known for a crepe called testeu. It’s a crepe made in a small terra cotta dish. When the crepe is done you spread a generous amount of pesto on top and lots of grated cheese. They used to make the crepes on a hot stone or a wood stove. Hi! Just came across your site and it is very interesting! 🙂 I tried to post a comment on that nice “10 top Italian American food fallacies article” but idk if it went through b/c I had to register. Anyways, I was browsing your recipes section and I’m surprised that this one doesn’t call for pecorino (sardo). I would leave the cream cheese out and add the pecorino to make it closer to the authentic pesto alla genovese 🙂 Ciao! Yes, Pecorino or Parm Regg or even Grana would work better. Out neighbor in the States, from Genoa, often used cream cheese as a way to enrich the sauce. Not authentic but very good.